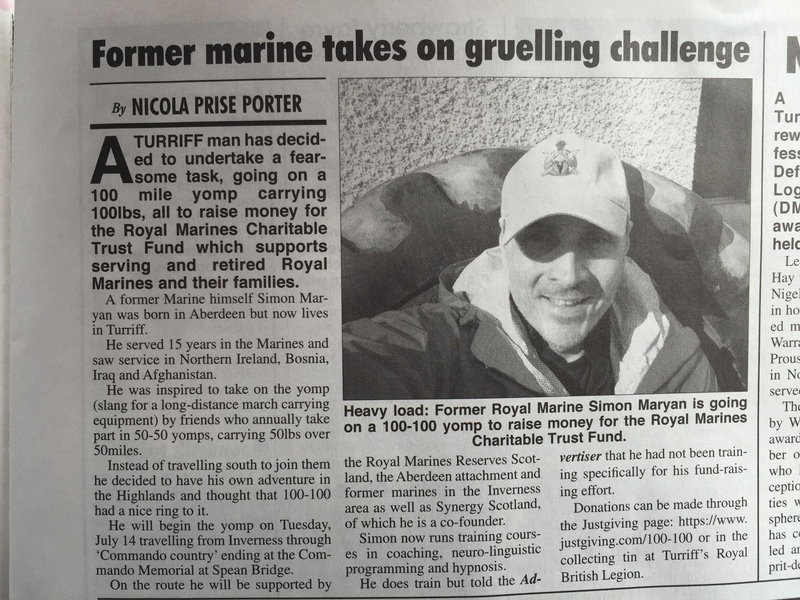 Being a former Royal Marine myself, I am extremely passionate about helping the Corps family support my colleagues and their families when they really need it, I have been supported by them myself and know what a fantastic job they do at RMCTF, so this is a way for me to pay back. I’m now a psychologist, clinical hypnotist and psychotherapist and run a private therapy practice based in Aberdeen where my area of expertise is help serving and former military personnel, emergency services and civilian individuals get back to normal functional and happy lives after trauma. This is my main driver behind doing this 100 mile yomp with 100lbs and to put that into perspective, 100lbs is 45kg or 7.5 stone and distance wise is the same as going from Aberdeen to Inverness. 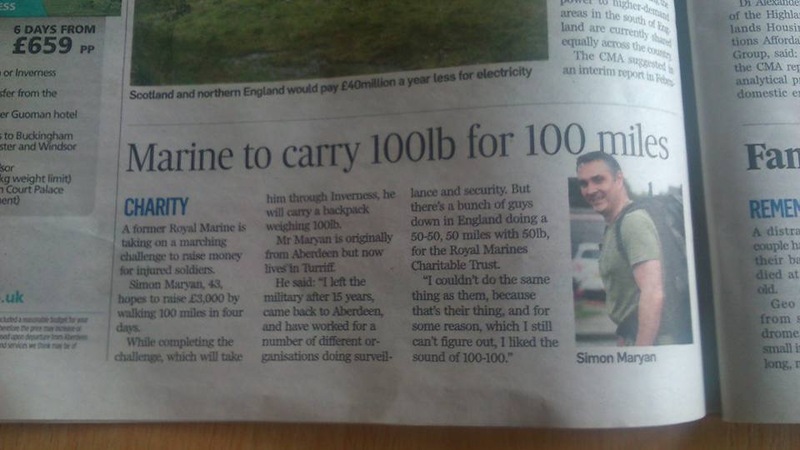 Since I first spoke to my friends at the Royal Marines Reserves detachment in Aberdeen about this I have now had confirmation that HQ RMR Scotland has agreed to provide a back up vehicle and manpower to assist me on the walk, which is fantastic. I am also being sponsored by Synergy Worldwide who I work with as an International Distributor, and they are providing me nutritional supplements to keep me going along the way. The exact route is still to be finalised however, in short, it is going to be from Inverness down the west side of Loch Ness, taking a right before Fort Augustus and back round to finish at the Commando Memorial at Spean Bridge. The plan is to do this Yomp over 4 days making it 25 miles per day. 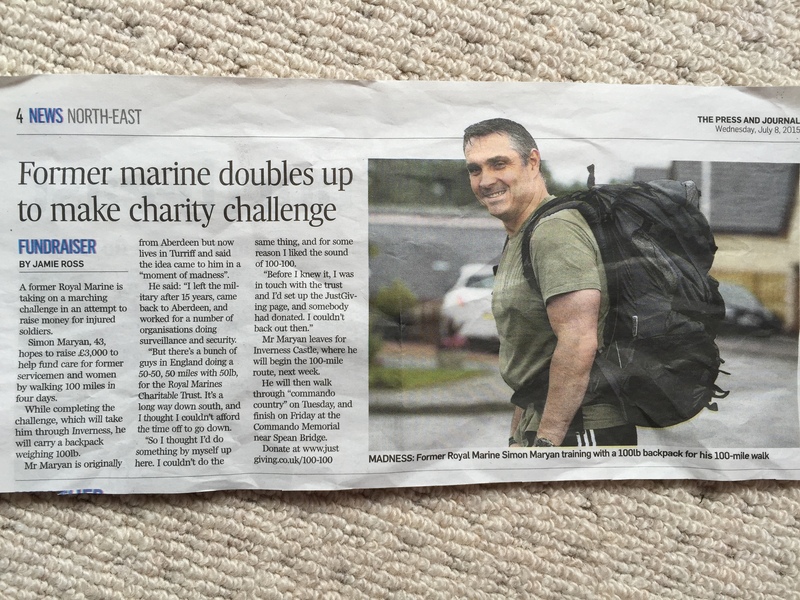 The dates are Tuesday 14th – Friday 17th July 2015 and if anyone is in the area and wants to join me for a stroll through the beautiful Scottish Highlands then feel free, all company during my little Yomp is much appreciated. Mobile phone signal permitting, I will be updating en route and hopefully live streaming via Periscope as I go and give live updates. I really appreciate you all sharing this post and asking your friends, family and colleagues to share donate what they can to this fantastic charity. All you have to do is click on the link below.